How "Hunger Games" Changed Archery Forever? Have you ever seen the main character of a movie do something awesome, like playing a crazy guitar solo, and think to yourself, "WOW, I am going to learn guitar as soon as I get home"? If so you are not alone. As a matter of fact, in 2012, millions of people went to the theaters to watch the Hunger Games, and after they watched "Katness Everdeen" (the hero of the movie) dominate the bad guys with her bow and arrows all through out the film many of these movie goers left the theaters inspired. Archery was suddenly very interesting and Katness had made shooting a bow look extremely fun and cool. After seeing this performance they too wanted to learn the art of archery and be able to use a bow like they had just seen on the big screen. Sudden surge in popularity! Saying archery experienced an increase of interest in 2012 would be an understatement. In 2012 archery was thrust into the spotlight and in an instant it had become a hot "new" sport for anyone and everyone of all ages. No longer was the sport just for male bow hunters like most had apparently always imagined it to be. Now kids of all ages, men, woman, and anyone else for that matter, were now flocking to the nearest bow shop to get a bow of their own. I remember this time period clearly because this was when my job became a lot more interesting. I was a salesman at the time and up until this point our most common customers were guys, from ages 15 and up, with the occasional exception. This all changed after the Hunger Games hit the big screens though and we all had to change right along with it. Jump started by pop culture! Did Hunger Games really cause such an incredible spike of interest in archery? YES! I am not going to beat around the bush on this one because it most certainly did. While it is true that other movies such as the Avengers and shows like Game of Thrones also helped increase interest in archery, it was Hunger Games that really sent the popularity of the sport into new territory. Archery had been growing at a steady pace for a very long time but in 2012 there was a serious sudden surge of interest in the sport and everyone in the industry was able to feel the impact. Going through some changes! Shortly after Hunger Games hit the big screen all of what we new about our customer base went straight out the window. Suddenly we were getting flooded with calls from a wide variety of customers. Now we were no longer just selling one bow to some guy but we were now selling a bow to him, his wife, and all his kids at the same time. Our little shop, along with many others across the world, took a serious increase in traffic and we all welcomed it with open arms. At the time I was not sure if this was just some random happenstance or if something had actually came along and made an impact on the sport. Before long it became clear to me that something had in fact managed to drive up the interest in archery to new levels and it was not very hard to figure out what had done it. It really was not all that hard to figure out because most of our new customers would actually refer to the Hunger Games as the reason they were taking up the hobby in the first place. Parents were especially quick to point out The Hunger Games as the reason they were ordering a bow as a birthday/Christmas gift for their child in the first place. The story was usually the same when parents of children called to order a bow for the first time. "We took our 3 kids to watch "Hunger Games" and they have all three wanted their own bow and arrows ever since. They want to learn to shoot just like Katness did in the movie." Another interesting part about this situation was the fact that MANY of these orders were coming in during the off season, a time we normally consider to be our "slow season". Archery's "slow season" normally takes place between March and July, but in the fall archery is always a booming industry because of the bow hunting community. After the Hunger Games hit theaters our slow season became a thing of the past and this alone had a sizable impact on the industry. This was a big deal but something even bigger was about to happen as a direct result of this new found popularity brought on by the success of The Hunger Games franchise . For the next couple of years the archery industry continued to thrive and grow at impressive rates. Eventually, the sudden jump in popularity was enough to convince the ATA (Archery Trade Association) to perform a study to see just how much public interest in the sport had continued to increase since the 2012 release of The Hunger Games. According to the study 21.6 million U.S. residents participated in archery in 2014. That’s a 14 percent increase from the ATA’s 2012 study, which found 18.9 million American participated. Those findings coincide with statistics from USA Archery which had also documented strong growth from the 2012 season through to the 2014 season. The study helped prove a direct connection between the sudden popularity surge in archery and the time frame in which archery becoming mainstream in films such as Brave, Hunger Games, and The Avengers. Not only did the films help introduce a new audience to the sport but this new audience was growing year after year. The impact was so clear that Jay McAninch, ATA President/CEO even addressed it. “We definitely see a correlation between the ‘The Hunger Games’ and a renewed excitement about archery,” He said. “Several contributing factors helped, such as the availability of more archery programs and instructors, but major events like ‘The Hunger Games’ and the Olympic Games did great things to grow our sport." Archery even managed to become the Olympics "most watched sport on NBC" during the 2012 Olympic Games. This is a huge accomplishment for our sport! Another study taken in 2015 showed that, in the eyes of young shooters, archery had managed to grow beyond "just bow hunting" and had now managed to become a very popular and healthy pass time for target shooters of all ages. Younger kids became more interested in archery and this is where the impact of "The Hunger Games" really managed to shake it up a bit. Archery was becoming popular as a family activity which meant many young children had decided that they also wanted a piece of the action. 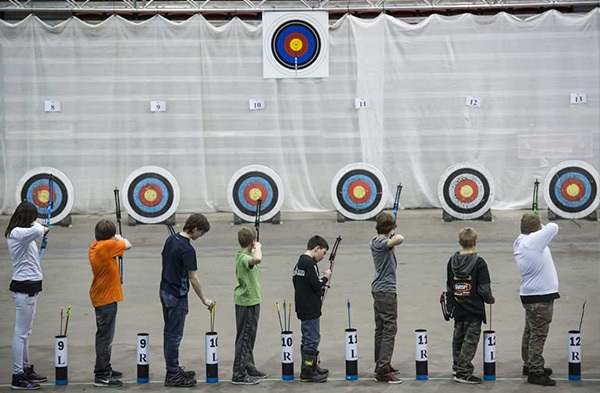 Kids as young as 5 years old were now extremely interested in archery as a possible new hobby. Unfortunately, at the time there were no good choices for small children looking to get started in the sport. This presented a huge problem, but also, a huge opportunity for bow manufacturers! There needed to be a bow that could actually adjust to fit anyone of ANY size or age. A bow that could be shot by seasoned bow hunters and immediately turned down for an 8 year old to shoot it - if need be. Little did we know that the race to build such a bow had already started behind the scenes. <="" strong="">Limited options for kids! 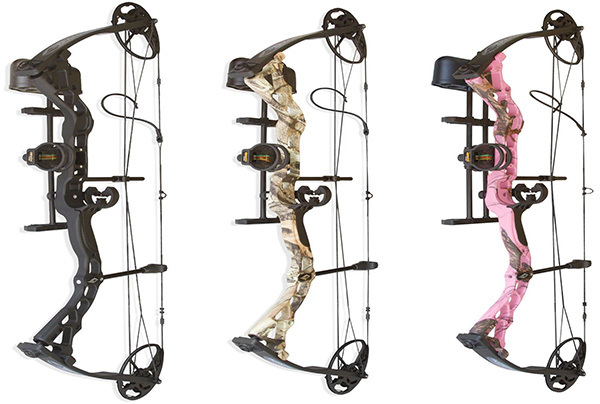 There are two different styles of bows (most commonly) on the market today. You have traditional style bows such as recurves or long bows, and then you have compound bows. In the movie Katness was seen using a traditional style bow and because of this a lot of kids wanted to go that route. Some bow manufactures milked the popularity of The Hunger Games and actually made a traditional "bow kit" meant to resemble the one from the movie. Unfortunately these bows were more on the "toy bow" side of things. These bows were only capable of a very low draw weight and kids out grew them very fast. Since compound bows are more adjustable and generally considered to be easier to shoot/hunt with, they became a popular choice for parents looking to get a bow for their growing child. As time went on, more and more kids/young adults became interested in the sport and wanted their own bows. Unfortunately, even with the adjust-ability of modern compound bows, finding a bow that would fit a small child was harder then it sounds. No one wanted to invest money into a bow their child was going to outgrow in a few months. The mission soon became to find a bow that would fit these younger children, BUT it had to be one that would also grow with them as long as possible... This was a tall order. No Mid-Range Adjustments - Not Enough or Too Much! Setting up a compound bow for someone is a lot like tailoring a suit to the person that will be wearing it. In order for it to fit comfortably you must get the sleeves and the leg lengths correct. Otherwise the suit will simply not work too well for the person wearing it. A compound bow is similar in this aspect and if certain criteria are not matched to the shooter then it will be significantly harder for them to enjoy shooting their bow. Compound bows are adjustable in both draw length (pull back length) and draw weight (weight being pulled back by the shooter). It is imperative, for the sake of accuracy, to set up both the draw length and draw weight for the person that will be shooting the bow. You can not take a 60# bow, hand it to a 10 year old, and expect them to start flinging arrows with it. Most full grown adult men can not pull back 50# when they first start shooting so expecting a child to do it is insane. At the time most compound bows were only capable of certain weight ranges such as 50-60# or 60-70# but this was way too much for young shooters. Draw length was also a problem because most bows would not accommodate shooters with wing spans shorter than roughly 5'5" or so. The limited adjustment capabilities of these bows made it almost impossible for a youth to shoot a compound bow designed for an adult male in a comfortable way. Even if you lowered the weight and length as low as possible, most compound bows at the time would still be way too much for a young child to shoot. There were some "youth" bows on the market at the time but those came with a set of their own problems. At this point a youth bow was just a mini version of existing adult bows. The problem with youth bows was actually the exact opposite as the problems with adult bows. Now outgrowing the bow was the problem. The "youth" bows of the time would only go up to 30-40# depending on the bow. It would not take long at all before kids were maxing out the weight at 40# and were ready for more, but the bow could not give them any more. This meant that parents were spending a fortune on a bow that their kid would out grow in a very short amount of time. There really were no good options when it came to shopping for youth compound bows. Some bows at the time claimed to have wide ranges of 15 - 70# on a single set of limbs but there was a lot of fine print involved and most of them just plain didn't deliver on their promises. An example of this would be the Diamond Razors Edge. This bow advertised a weight range of 15-60# and it could do it but there was a catch. The weight range could not be accomplished on the same set of limbs! You actually had to have the limbs swapped out when your child was ready for more weight. You would start out with 15-30# limbs and once your child was ready fop more you would have to purchase the 30-60# limbs via the (grow up plan) Diamond had in pace at the time. This was a ton of trouble and, needless to say, it left a bad taste in the mouths of parents that had fallen for the false promise of "adjust-ability". Everybody just wanted a bow that would adjust down low enough for their kids to shoot but one that would also grow with their kids. Was that really too much to ask? The Hyper-Adjustable Era Finally Begins! Changing the game, forever! The archery industry was booming and we were seeing a variety of new shooters like never before. We had still not managed to find a perfect solution to solve the challenging "growing child" issue but we were making due. When parents called looking for an adjustable bow for their young child we would do our best to teach them and give them a firm understanding of the situation. At least this way they knew what they were getting into. Eventually there came a solution to this problem, a real life breakthrough, and it changed everything. Manufactures had finally realized that it would be insane not to pursue a compound bow that could adjust to fit anyone wanting to shoot it. No limb swapping or any crap like that would be necessary, just straight up adjust-ability to fit everyone. Up until this point most bow manufactures thought the money was in dividing the bows up into ranges. To them the idea of making a single bow that could fit anyone was dangerous to the bottom line. If one bow could last you forever then why would you ever buy a new bow? Thankfully, they were able to put this kind of thinking aside and finally see the potential in the idea of an "everybody bow". Then it happened, rumors turned into facts as The Diamond Infinite Edge hit the market and boy did it ever shake things up a bit. Everything was done so well on this bow. The marketing campaign was perfectly aimed at the Hunger Games hype and clearly explained how this bow solved the adjust-ability problems of previous youth bows. This new bow didn't just have a 10" range ( from 50-60# or 60-70#) like most bows at the time. NOPE, this one went from 05# - 70# on a single set of limbs. The draw length was also capable of being adjusted as much as you could ever need it to be. I have personally turned this bow from 70# with a 30" draw length, all the way down to where a 6 year old could shoot it comfortably! The best part was that all of these adjustments could be made with a set of Allen Wrenches and without a bow press. The Infinite edge could be shot by anyone of any size and skill level! This was a first and people were impressed. Our phones exploded off the hooks. We couldn't stock that bow fast enough to keep up with the demand. When the Infinite Edge hit the market we were still riding the "archery hype train" caused by all the successful movies featuring archery, and The Infinite Edge was just in time to capitalize on it. This bow went on to become the best selling bow of the year virtually all over the country two years in a row and was praised by many in the archery community. Especially the ones looking to set up growing children with a new compound bow. A new market was born. It did not take long for many of the other manufacturers to jump on board the hyper-adjustable compound bow concept. Soon we started seeing other companies bring out their own hyper-adjustable bows and a lot of them proved to be very good. These bows were being bought by youths, new adult shooters and seasoned adult hunters alike, but the best part was that everyone was happy with how they worked. The birth of this concept really did leave a positive, permanent mark on how bow manufactures design their bows nowadays. The birth of hyper-adjustable bows has also allowed for people that could have never dreamed of shooting a bow to pick one up, set the weight down low, and shoot away. Shooters with shoulder problems, for example, are now able to get back on the range and fling some arrows. I am sure the directors of these blockbuster movies featuring archery had no intention - or clue - of what was going to happen in the archery world after these films made it big. The way all the events played out is honestly pretty amazing if you ask me, and it was all set into motion by kids watching a movie.